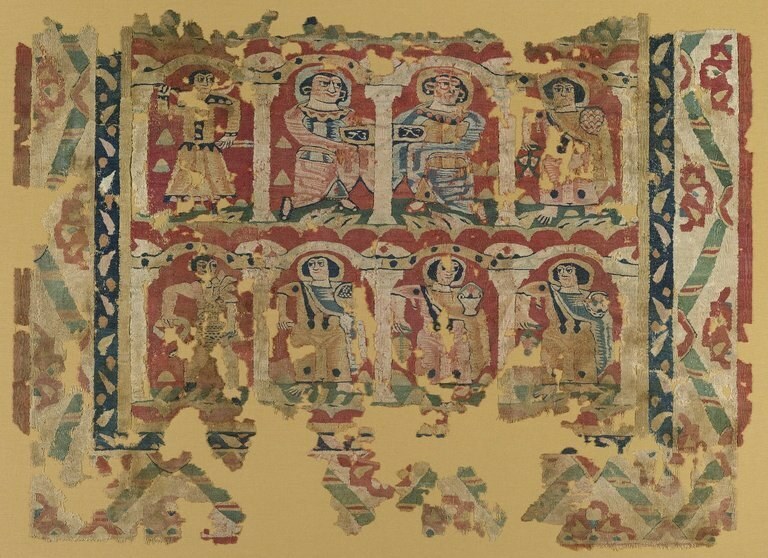 Tapestry weave of dyed wools and undyed linen, a: H. 103 cm; W. 148.2 cm. b: H. 5.5 cm; W. 15.5 cm. Egypt, ca. 6th–8th century CE. Brooklyn Museum, Charles Edwin Wilbour Fund, 46.128a–b. This wall hanging depicts an arcade of three stories or more of servants at work on behalf of the household. They carry flowers, baskets, and chalices piled high with fruit. In the fuller, original composition, these figures may have represented a calendar with personifications of the months, bearing the earth's bounty for each month, thereby ensuring prosperity for the household.